First of the season’s fava beans this week. 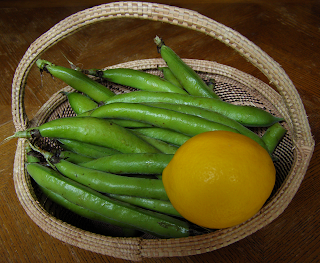 Young favas can be eaten pod and all, if the beans are small. Even if the beans inside are big enough to eat on their own, as long as the pods are still green and smooth and “give” when you squeeze them, it’s still fine to eat the pods, if you like. When the pods are big and yellow, and/or tough, you will want to shell them and find another way to eat them. But in the meantime, enjoy this recipe. I thought that I got this recipe from Live Earth Farm, but don’t see it in their database. I think someone gave me this idea from Bon Appetit magazine or similar source. Sorry that I’m unable to give credit. However, I do remember that in place of dill, I substituted the lemon zest, and added the lemon juice garnish. I also reduced the salt. This changed the dish considerably, to a more spring-like fare. Cut onion or leek in half and slice thinly. Remove ends of fava pods, pulling off any strings that you can. Slice pods into 2” lengths. 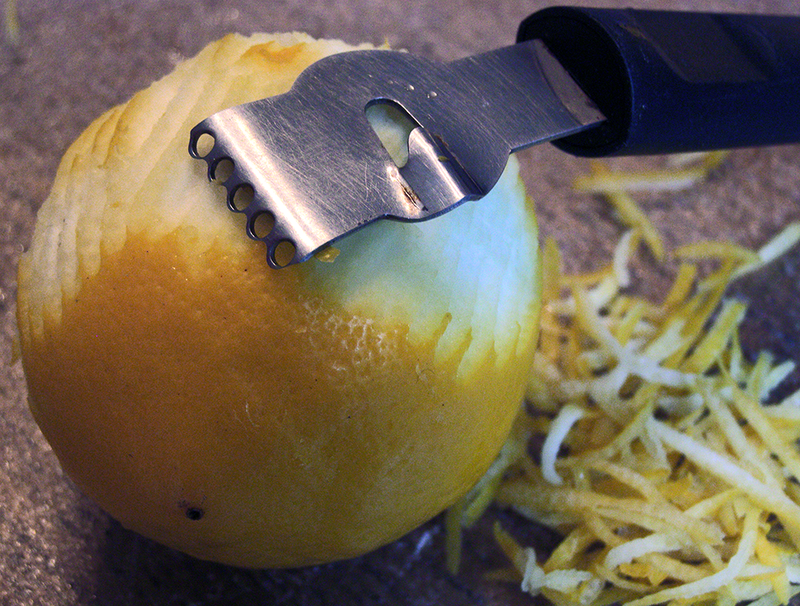 Make zest from the entire lemon peel. Using a lemon zester (see photo) is better than using a grater--the larger lemon zest pieces add color and texture to the dish. Juice the lemon and strain the juice into a condiment dish to serve with the favas at the table. Sauté onion in oil until fragrant over medium high heat, about 1 minute. Add favas, salt, sugar, and water. Bring to a simmer, cover and cook about 20 minutes. Add lemon zest. Check the braising liquid level and add 1/8 cup water if needed. 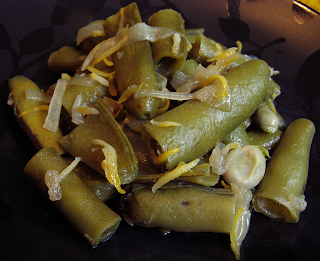 Cook till favas fall apart and flavors are blended, about 5 – 10 minutes. Serve with lemon and salt.